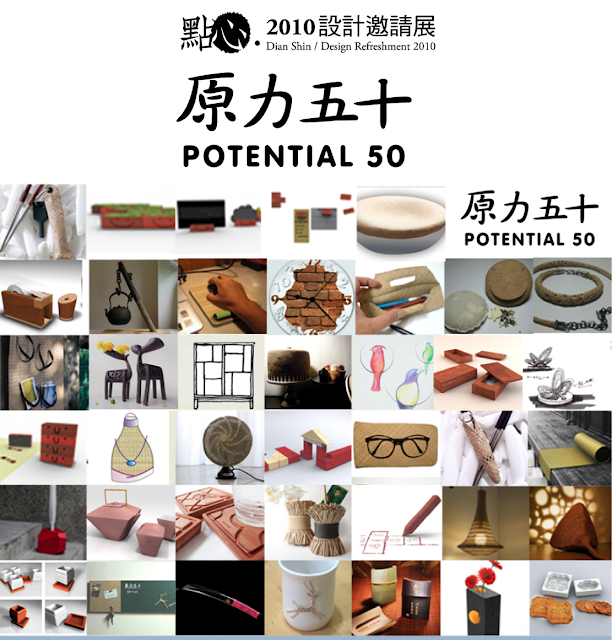 Potential 50＿The aim in revisiting local geography and history, and looking for long practiced Taiwanese crafts, is to strengthen our own identity. Over time, a number of different peoples have arrived in Taiwan to make up its present population. As a result there are very many stories about how people have adapted to local traditions and the climate when starting their families. These experiences involve not only shaping the original landscape but forming the foundation for future economic growth. Materials and skills change over time and the local landscape is transformed by industrialization. Untapped potential, however, is our most valuable resource to deepen cultural competitiveness. Actively participating in, and evaluating, Design Refreshment 2010 has led designers away from cities. By participating in a community's culture and industrial re-engineering designers have been drawn to the rural landscape and industrial heritage. Consequently, designers bring about design with powerfully moving stories. Yuan-li Town of Miaoli County, between southern and northern Taiwan is where two climate zones meet. In places like Hwataoyao gardens increasingly dominate the local landscape, while there are traditional handiwork crafts such as grass-weaving, brick- and pottery-making and woodcarving. We hope that designers can make good use of these materials to reflect the local natural and cultural features. Exhibits undergo rigorous selection and are distributed through existing channels in an attempt to strengthen local economy.